Canon EOS M6 offers a DSLR photo experience in a compact body. 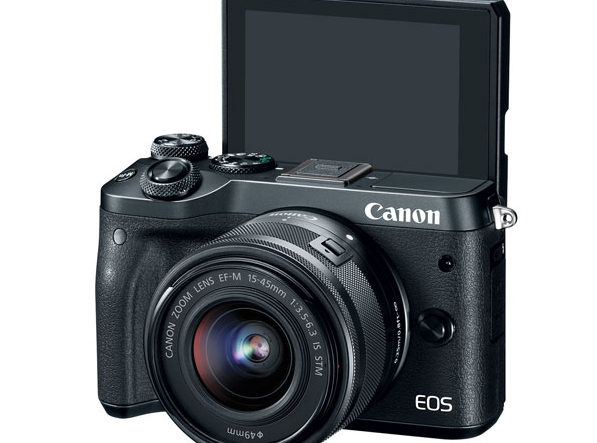 Canon, unfortunately, had not been able to give the photo enthusiast what he wanted with the EOS M, the first machine in the family, about 5 years ago. Especially because of the slowness in the autofocus system, EOS M suffered quite a lot of users. The company later released a solution to this problem with the software, but the Canon EOS M was disappointing. Later on, Canon, which achieved success by selling EOS M2, M3, M10 and M5 models, is confronted with its new machine EOS M6. Having left behind all the problems experienced at the EOS M, Canon also carries on the powerful performance offered by the other top segment cameras with the new compact mirrorless EOS M6. We can say that the M6, which is lighter at the same time from the EOS M5, which targets more professionals, will be preferred by those who care about both portability and performance. The machine that Canon sends to our office has a black color, but the silver color of the EOS M6 is also available. On the upper part of the rangefinder-type mirrorless machine with metal body, there are 12 different shooting modes including manual and automatic, a wheel that enables you to adjust the exposure compensation, a power button, and a shutter button. The power on/off button on the machine is located just below the exposure compensation wheel. On the right side is a button for HDMI and a wireless connection, and on the left side of the machine is a flash button, microphone and USB connections. SD card entry is under the EOS M6. When we look at the ergonomics of the EOS M6, we are not as successful as the other mirrorless compact machines on the market. If you are a DSLR user, you may have difficulty using it at first in the compact body of the EOS M6. The Canon EOS M6 uses the Dual Pixel autofocus system as is the case with the EOS 800D and EOS 77D models. With this system, the machine can detect fast moving objects quickly and accurately. Let’s just say that the speedy autofocus performance offered by the machine has also benefited us. Another feature of the Canon EOS M6 is its 5-axis digital image stabilization. This system, which has recently come to light in most photographic machines, aims to avoid the jolts that can occur in photographs and videotapes. This makes it possible to take higher quality pictures in low light. The 24.2 megapixel APS-C sensor is preferred, and the low light performance of the machine varies depending on your lens preference. It is also possible to choose the EF-M 15-45mm f / 3.5-6.3 IS STM lens on the machine which achieves highly successful frames at aperture values of F / 1.8 or F / 2.8. Despite the fact that it is a small camera, the EOS M6 still delivers the performance of a successful photo. Although it does not support 4K video recording, it is possible to perform 60 frames full HD video recording on the camera at the moment.